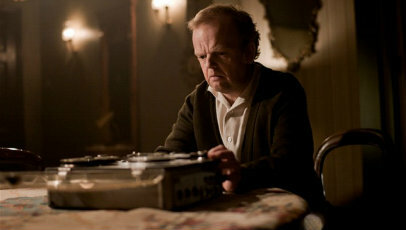 Gilderoy (Toby Jones), a reserved and modest British sound engineer, is hired by Italian schlock director Santini (Antonio Mancino) to score his latest film, slyly titled The Equestrian Vortex. Upon his arrival, he’s immediately intimidated by the Italians and baffled as to their unique approach to a variety of things, particularly the tools they use to create the film’s score and the lack of interest they have in reimbursing his travel expenses. As he attempts to put cultural differences aside and adopt a thrifty approach to his work than he’s familiar with, he soon finds the macabre scenario in which he’s landed in is having more of an effect on him that he could have anticipated. Hinged on its ability to deconstruct and satirise those fundamental aspects of horror that evoke the necessary reactionary emotions in the audience, Berberian Sound Studio is more certifiable perplexity than straight-up horror-thriller, albeit a boundary upon the edge of which it often teeters. Writer and director Peter Strickland has created a film that’s far more concerned with how, even when the effects and artifices have been stripped back to their bare bones (elementary, synthetic means take precedence over electronic methods to manufacture the necessary sound effects), a sense of alarm and uncertainty is left intact. This unease is achieved through organic means: pitch-perfect sound design; the atmospheric layout and execution of the claustrophobic, tense sound studio; and Gilderoy’s ever depleting grasp of reality – represented by the many shots that focus on the rotten, decaying vegetables that have been beaten in more ways than one to create particular sound effects, such as the pulling of hair or someone’s unfortunate stabbing. The fact that Strickland shifts emphasis away from imagery and onto how what we can and can’t hear can have the same, if not a more intense, effect on our inhibitions and understanding (or lack of) of what’s happening. Strickland may make it fundamentally clear that most of The Equestrian Vortex’ tenor is artificial, and even infrequently interrupts the overwhelming tension with welcomed infusions of caustic humour that further help pinpoint the exact kind of filmmaking he’s taking aim at. Nevertheless, and commendably so, that never prevents the ensuing twists and turns from continuing to test our investment, or the many reactions from Gilderoy and the various contributors that have secondary, yet effective, reverberations on the increasingly disturbed, tested audience. Jones prevails in his portrayal of Gilderoy, a man slowly losing his mind and ability to distinguish between reality and fantasy. His performance may be restrained but, through his various facial expressions, consistently nervous demeanour and the powerful influence sound has over him, he’s able to convey Gilderoy’s downward spiral in such a way that has a knock on effect on the baying audience, constantly challenging their belief systems and understanding of exactly what’s happening on screen. It’s a role he was born to play, and he’s reinforced well by the here and their supporting cast. What Berberian Sound Studio accomplishes is a return to a more basic style of filmmaking than we’ve become accustomed to in recent years. Strickland displays a masterful possession of both Gilderoy and his audience by tricking them with what our senses cannot track. The ending to some may be a tad ambiguous, but it’s an experience that roots itself deeply in the mind and doesn’t let up. Cleverly layered and timeworn to bait and daze, Strickland has shaped a deeply stirring trip through the senses. Great review. Can’t wait to see this film. Thank you. Let me know what you think when you’ve seen it.